Dos Playa, Aruba. Awesome scenery, it’s a great way to spend the day on the rough east coast of Aruba. Located in Arikok National Park, approximately 1.5 kilometers north of Boca Prins, you will find Dos Playa. This beautiful, secluded location consists of two coves that both have rather narrow beaches. One beach is about 100 meters wide and stretches for about 200 meters into the mainlands of Aruba. The most northern beach is approximately 70 meters wide and continues for about 100 meters into the mainland. The amount of sand is ever changing on both beaches because of the strong northeastern trade winds. Dos Playa is one of the most secluded beaches in Aruba as there are no amenities and it takes quite an effort to get there. 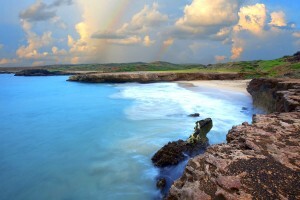 On the other hand it is a beautiful place to go to enjoy the rougher north-east coast of Aruba. Swimming or snorkeling is not recommended, the waves are sometimes just too big. At Dos Playa you will find surfers challenging the waves and currents on a daily basis, especially in the weekends. 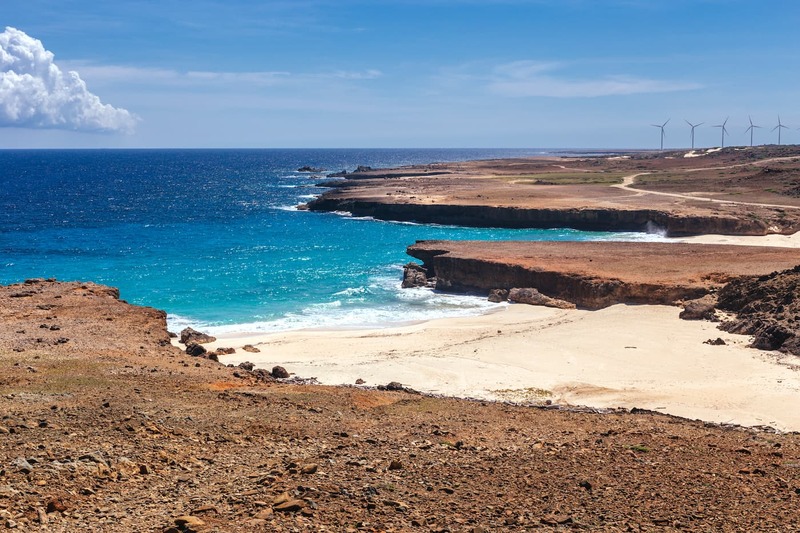 It is recommended for secluded beaches in general to prepare your visit well, also make sure you arrange the proper transport when visiting Dos Playa, there are a lot of unpaved roads in this part of Aruba. Dos Playa happens to be one of the best surfing spots of Aruba. Many (local) people choose this beach for some bodyboarding as well, so keep an eye out for them if you decide to go surfing here. The spot is located in a bay with rather large cliffs, turning the waves into high peaks with wave barrels up and down the beach. When the winds decrease at the end of the afternoon, you’ll have a swell of about 4 feet. There are practically always waves to surf on. The waters can be like a washing machine with a powerful pull, so this beach is for the experienced surfer and bodyboarder only. If you can, go surfing with a local. They can tell you more about underwater dangers such as rocks, coral, rips, and undercurrents. From Oranjestad make sure you enter Caya G.F. Betico Croes driving to the east. Follow directions to Cumana and eventually follow road 7 all the way to Boca Prins. Just before you reach Boca Prins make sure you make a left and continue following the road to Dos Playa. The trip should not be longer than 17 kilometers (25 minutes, depending on traffic).